For other uses of "Menlo Park", see Menlo Park (disambiguation). 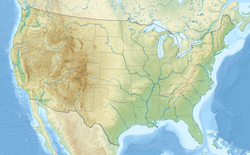 According to the United States Census Bureau, the city has a total area of 17.4 square miles (45 km2), of which 9.8 square miles (25 km2) is land and 7.6 square miles (20 km2) is water. The total area is 43.79% water. Menlo Park is long and narrow on a northeast to southwest axis. The northeast portion borders the San Francisco Bay and includes the Dumbarton Bridge that connects Menlo Park to Fremont on the east side of the bay. The city shoreline includes the city's largest park, Bedwell Bayfront Park 160 acres (65 ha) and the Don Edwards San Francisco Bay National Wildlife Refuge. San Francisquito Creek marks much of the southeast border of the city. West Menlo Park (not part of the city despite its name) along Alameda de las Pulgas nearly separates the southwestern part of the city (known as Sharon Heights) from the rest. The extreme southwest is clipped by Interstate 280. The Bayshore Freeway (part of U.S. Route 101) traverses Menlo Park northwest to southeast near the shoreline and somewhat parallel to it to the southwest is El Camino Real. The intersection of El Camino Real and Santa Cruz Avenue is considered the heart of the city. Nearby, the Menlo Park Civic center is bounded by Ravenswood Avenue, Alma Street, Laurel Street and Burgess Drive. It contains the council offices, library, police station and Burgess Park which has various recreational facilities. Other major roads include Sand Hill Road in the Sharon Heights area. The residential areas of Menlo Park are unofficially divided into several neighborhoods. Belle Haven is the only neighborhood east of the Bayshore Freeway; much of the rest of that area is business or protected land. Between Middlefield road (a road almost parallel to Bayshore) and Bayshore are the neighborhoods of the Willows, Suburban Park, Lorelei Manor, Flood Triangle, Vintage Oaks, and South of Seminary (the seminary being Saint Patrick's Seminary). Between Middlefield and El Camino Real are Felton Gables, Linfield Oaks, and Park Forest. West of El Camino Real until the hills are the neighborhoods of Downtown Menlo Park, Central Menlo Park, and Allied Arts (sometimes also known as Stanford Park, it is named for the Allied Arts Guild in it). In the hills are Sharon Heights and Stanford Hills. Several other neighborhoods are closely associated with Menlo Park but are actually in unincorporated San Mateo county; these include Menlo Oaks and Fair Oaks (latter part of the North Fair Oaks census area) between Bayshore and Middlefield, University Heights (also known as West Menlo Park) between Sharon Heights and most of the rest of the city, and Stanford Weekend Acres which is somewhat near Stanford Hills. In 1917/1918 a large portion of Menlo Park was the site of Camp Fremont, a training camp for, at its height, 27,000 men being sent to fight in World War I. It didn't last long (the camp was dismantled after the war), but army engineers paved the first streets in Menlo Park and laid the first water and gas lines. The army did retain the camp hospital, and it is now the site of a Veterans Administration hospital off of Willow road in Menlo Park. In the autumn of 1918 a flu pandemic hit Camp Fremont and killed 147. At the start of World War II, the US government bought the 260-acre (110 ha) estate of Timothy Hopkins from his widow and created the Palo Alto General Hospital later renamed the Dibble General Hospital (after Colonel John Dibble who was killed in 1943). After the war ended, some of the land was sold to the city and became the sites of the main library and city hall. More of the land was bought by Stanford University to house the increase in students due to the G.I. Bill; the area was known as the "Stanford Village," which existed as student housing until the mid-1960s. This land also was the site of the Stanford Research Institute (now SRI International) starting in 1947; between 1955 and 1968 SRI bought the rest of the Stanford Village. In the 1960s, the former 600 acres (240 ha) estate of Frederick W. Sharon (1859–1914) (son of Senator William Sharon) and his wife, Louise Tevis Breckinridge Sharon (1858–1938; daughter of Lloyd Tevis and divorced wife of John Witherspoon Breckinridge), in the hills of south west Menlo Park was developed and called "Sharon Heights." In terms of age 7,805 residents (24.4%) were under the age of 18, 1,817 people (5.7%) aged 18 to 24, 9,563 people (29.9%) aged 25 to 44, 8,263 people (25.8%) aged 45 to 64, and 4,578 people (14.3%) who were 65 years of age or older. The median age was 38.7 years. For every 100 females, there were 93.7 males. For every 100 females age 18 and over, there were 91.5 males. There were 13,085 housing units at an average density of 1,336.6 per square mile (516.1/km²), of which 6,927 (56.1%) were owner-occupied, and 5,420 (43.9%) were occupied by renters. The homeowner vacancy rate was 1.1%; the rental vacancy rate was 5.2%. 18,972 people (59.2% of the population) lived in owner-occupied housing units and 12,209 people (38.1%) lived in rental housing units. As of the census of 2009, there were 33,690 people, 12,543 households, and 7,248 families residing in the city. The population density was 3,441.3 inhabitants per square mile (1,328.7/km2). There were 14,026 housing units at an average density of 1,432.7 per square mile (553.2/km²). 64.2% spoke English, 19.5% Spanish, other Indo-European 4.2%, 4.6% Chinese or Mandarin, and other language 0.7%, as their first language from estimate census 2009. There were 12,543 households out of which 25.8% had children under the age of 18 living with them, 41.5% were married couples living together, 10.8% had a female householder with no husband present, and 45.67% were non-families. 35.1% of all households were made up of individuals and 11.1% had someone living alone who was 65 years of age or older. The average household size was 2.46 and the average family size was 3.15. In the city, the population was spread out with 25.8% under the age of 18, 9.1% from 18 to 24, 31.5% from 25 to 44, 20.4% from 45 to 64, and 14.2% who were 65 years of age or older. The median age was 32 years. For every 100 females, there were 94.0 males. For every 100 females age 18 and over, there were 90.6 males. As of the 2000 estimate census, the median income for a household in the city was $82,609. Males had a median income of $77,766 versus $59,101 for females. The per capita income for the city was $51,341. About 5.9% of families and 7.3% of the population were below the poverty line, including 9.8% of those under age 18 and 8.7% of those over age 64. As of 2009 the median income for a family was $123,251. City Council members are elected at-large to staggered, 4-year terms, in non-partisan municipal elections held every two years. On the San Mateo County Board of Supervisors, Menlo Park is split between Supervisorial District 3 (west of El Camino Real) and Supervisorial District 4 (east of El Camino Real). represented by Don Horsley and Warren Slocum, respectively. In the California State Legislature, Menlo Park is in the 13th Senate District, represented by Democrat Jerry Hill, and in the 24th Assembly District, represented by Democrat Marc Berman. In the United States House of Representatives, Menlo Park is split between California's 14th (east of Bayshore) and 18th (west of Bayshore) congressional districts, represented by Jackie Speier (D–Hillsborough) and Anna Eshoo (D–Atherton), respectively. According to the California Secretary of State, as of February 10, 2019, Menlo Park has 19,339 registered voters. Of those, 9,984 (51.6%) are registered Democrats, 2,989 (15.5%) are registered Republicans, and 5,683 (29.4%) have declined to state a political party. For higher education, Saint Patrick's Seminary and University is a Catholic seminary in Menlo Park. Fuller Theological Seminary, an evangelical Christian school, has a branch campus in Menlo Park. Much of Menlo Park's economy revolves around the companies on Sand Hill Road, consisting of venture capital, private equity, financial services, law firms, and other professional service companies and investment vehicles focusing on technology. Geron, Robert Half International, Exponent, and SRI International are among the companies based in Menlo Park. Facebook moved its headquarters to the former campus of Sun Microsystems in Menlo Park in December 2011. Thorstein Veblen, sociologist known for "Theory of the Leisure Class"
^ "City Council". City of Menlo Park. Retrieved December 16, 2014. ^ "Menlo Park". Geographic Names Information System. United States Geological Survey. Retrieved December 19, 2014. ^ "Menlo Park (city) QuickFacts". United States Census Bureau. Archived from the original on August 24, 2012. Retrieved April 13, 2015. ^ Schwartz, Carly (November 17, 2011). "California's Most Educated Cities: Palo Alto, Los Altos Top the List". The Huffington Post Online. Retrieved September 9, 2012. ^ "Census 2010: Table 3A – Total Population by Race (Hispanic exclusive) and Hispanic or Latino: 2010". California Department of Finance. Archived from the original (Excel) on December 3, 2013. Retrieved March 22, 2010. ^ "U.S. Census Bureau QuickFacts: Menlo Park city, California". www.census.gov. Retrieved January 28, 2018. ^ "Bedwell Bayfront Park". Menlo Park, CA. Retrieved February 4, 2017. ^ a b "Menlo Park neighborhoods". Palo Alto Online. February 9, 2017. Retrieved February 10, 2017. ^ a b c d e Hoover, Mildred Brooke; Douglas E Kyle (2002). Historic Spots in California (4th ed.). Stanford, CA: Stanford University Press. p. 405. ISBN 978-0-8047-4483-6. ^ a b Durham, David L (1998). California's Geographic Names: A Gazetteer of Historic and Modern Names of the State. Clovis, CA: Word Dancer Press. p. 662. ISBN 978-1-884995-14-9. ^ "Menlo Park history". City of Menlo Park - Official Website. Retrieved February 5, 2017. ^ "The Origin of New Jersey Place Names", New Jersey Public Library Commission, May 1945, p. 20. ^ Kazak, Don (April 13, 1994). "The Peninsula mobilizes for war". Palo Alto Online. Retrieved February 5, 2017. ^ "Historic California Posts: Camp Fremont". www.militarymuseum.org. Retrieved February 5, 2017. ^ United States War Dept. (1919). War Department Annual Report, Vol. 1. p. 2157. ^ "History of the District & Community / Thurlow Estate becomes Dibble General Hospital becomes SRI Int". Menlo Park City School District. Retrieved February 5, 2017. ^ "Dibble General Hospital". www.militarymuseum.org. Retrieved February 5, 2017. ^ "Corporate History". SRI International. Retrieved February 5, 2017. ^ Svanevik, Michael; Burgett, Shirley (November 30, 2016). "Matters Historical: From San Francisco to Europe to Menlo Park – The Mercury News". The Mercury News. Retrieved February 6, 2017. 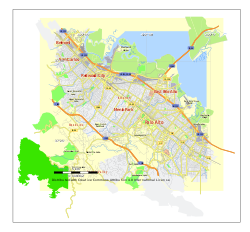 ^ "MLS 301 - Sharon Heights / Standford Hills - Silicon Valley and Beyond". Silicon Valley and Beyond. Retrieved February 6, 2017. ^ "2010 Census Interactive Population Search: CA – Menlo Park city". U.S. Census Bureau. Retrieved July 12, 2014. ^ "QuickFacts: Menlo Park city, California". United States Census. Retrieved October 1, 2015. ^ "Best places to live 2008". CNN. Archived from the original on October 23, 2013. ^ "Elections". City of Menlo Park. Retrieved February 2, 2015. 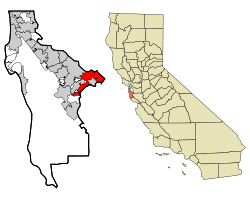 ^ "County of San Mateo Board of Supervisors". City of Menlo Park. Retrieved February 2, 2015. ^ "Schools Directory". Archdiocese of San Francisco. Retrieved November 2, 2016. ^ "Quick Facts". Peninsula School. Retrieved November 2, 2016. ^ Mahbubani, Rhea (March 18, 2015). "German-American International School will move to old Menlo Oaks campus this fall". San Jose Mercury News. Retrieved November 2, 2016. ^ "Fuller Bay Area". Fuller Theological Seminary. Retrieved November 2, 2016. ^ Guynn, Jessica (May 29, 2012). "Menlo Park set to approve Facebook campus expansion plan". Los Angeles Times. Wikivoyage has a travel guide for Menlo Park. 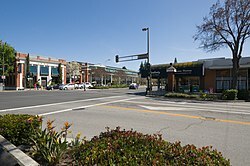 Wikimedia Commons has media related to Menlo Park, California.